Our family has a long history of volunteering with Little Brothers, dating back about 30 years. We work at our local senior center in Tapiola for the holiday meals, as well as other events as time allows. I got a call last week that they needed help with their pasty fundraiser. They take pre-orders for pastys, and then gather volunteers at the L’anse VFW kitchen to prepare them. I had helped last year, arriving mid day to help with cleanup. It was then that I met Don, an elderly man that is a member of the VFW, and that understands pasty making on a large scale probably as well as anyone on the planet. 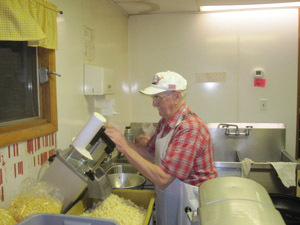 Don is also a very fine man, that gives up about 3 days per month making pastys for various volunteer organizations. The call I got this year requested I come at 6:00 am. 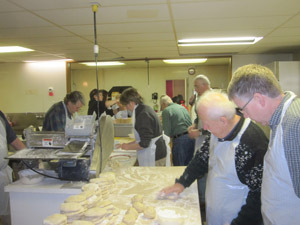 When I arrived, the kitchen was already humming with activity, including about a dozen volunteers. Don was among them, and when he saw me he gave me a big grin that told me he remembered me from last year. I got put at the end of the production line. My job was to take the thin circles of dough, stretch them on the table in front of me, put a dinner plate over the dough, and then trim it to size with a butter knife. This picture shows the dough table where the premade dough balls are flattened and stacked next to the dough roller. This two-pass machine first flattened these dough cookies into a football shape, flipped 90 degrees, and then made into a mostly round flat pancake that went to the trimmers. The man running the dough roller took an interest in me while I was working as a trimmer, and showed me how to run his machine. Then he disappeared! I’d been promoted to dough roller. I was wedded to that machine for about 6 hours. I got pretty good at it too, but I guess after about 1,200 pastys, anyone would develop a knack for that job. I forgot to mention that the trimmings from the dough pancakes all went to a plastic bag behind the trimming table. Bag after bag of trimmings accumulated. I asked about them, and learned that the volunteers could take some home if they wanted to. A seed was planted. At the end of the morning, when the last pasty was placed in the oven, I finally shut off my machine and took a break. I’d brought a insulated cup of iced tea along, but hadn’t had the time to sip it until then. After about 5 minutes it was back into the kitchen to start the cleanup process. Unfortunately almost everyone left once the baking was done, so the cleanup was left to a small group of us. We had fun with it though, and by about 3:00 we had the kitchen looking spiffy. I spoke with Laura, an intern with Little Brothers, at the end of the day, and asked if I could have some of the left over dough. She said sure and gave me some as I walked out to my truck. As I was driving home from L’anse, a plot was hatching in my mind. I’ll admit to you that I have a weakness for apple pie. When one has a weakness, one tends to study the object of his weakness. Alice and I have learned how to make pretty good apple pies. The crusts are flaky, yet melt in your mouth like butter. The filling, when cooked properly, is a warm sauce of apple chunks suffused with sugar, a hint of cinnamon, and just the right amount of tart that a good pie apple brings. When a properly made apple pie comes out of the oven and is served up on a plate, the world becomes a better place. There are other apple pies in the world. There are the frozen ones that mimic a decent pie. There are restaurant apple pies that can surprise you. Most are somewhere around the grocery store frozen variety, but now and then, you run across a restaurant that makes decent pie, and suddenly dessert becomes the best part of the meal. The plot I was hatching on the drive home was to bake an apple pie using the dough I’d scored from the pasty party. After a refreshing nap, I got to work peeling, and preparing the apples. Next I rolled out two balls of dough the old fashioned way, with a rolling pin, placed them in the pie pan, loaded up the apples, and plopped them in the woodstove. After the first 15 minutes, the crust was already brown on top, which can happen with a wood stove. The temperature can be difficult to control. I moved the pie to the bottom rack, and set the timer for another 15 minutes. This went on for just about an hour until the top was so brown I was afraid it would burn. I took the pie out and put it on the counter just about the time Alice came home from work. After supper and my walk with the dog, we cut into the pie. It was probably the worst pie I’ve ever eaten. The top crust was more like a cracker than a crust. The bottom crust was like dough. The apples had not cooked through properly. It was sweet and fatty, though, so I finished my piece. I do think that one of the things I like about pie is that it is less predictable than a cake. It is good to have a disaster now and then. It makes you appreciate the pies that come out right. This entry was posted on Friday, February 24th, 2012 at 9:40 pm and is filed under Uncategorized. You can follow any responses to this entry through the RSS 2.0 feed. You can leave a response, or trackback from your own site.